The reporting language is great for creating nice reports. You can, for instance create an MS Word document with a style based on what you want to see with layouts, tables, logos and more. Then simply save the file as HTML in MS Word and then open the HTML file in a text editor and add PFCLReport language variables where you want to have the data and output. We wanted report creation to be at the simple level of office tools so that as many people as possible can easily create their own reports without being programmers. We also do not obfuscate or encrypt the shipped templates; these are just text files (.tem) that you can read and edit or change if you wish to see how we did it. Finally, we also included a Word Processor that can save files in PDF, Word 97-2003 and current .docx file formats and a programmer�s editor. 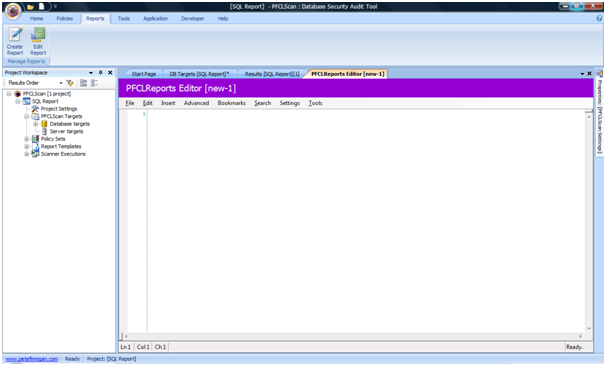 The fact we have these two tools in the PFCLScan interface also means that you can develop reports completely in PFCLScan. Now, normally we could run a report that creates a nice HTML report that we have the option to save as an MS Word document or save as a PDF for distribution. 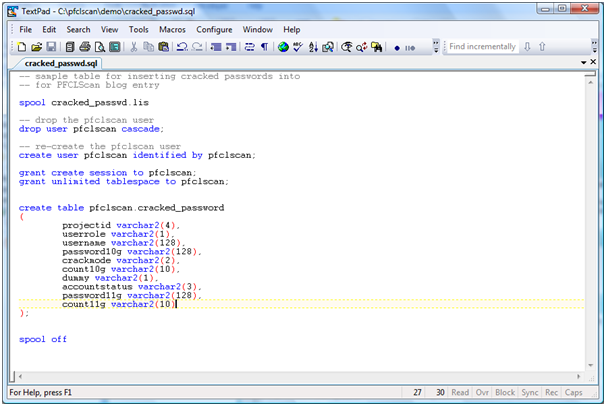 Because we want to save the cracked password data to a database (in this example we use the same database; that is just for ease of this example and would not be the case in a real scenario as we would not advise storing the cracked passwords into the database that was analysed. This is just an example for the technique). These results could be scanned from many databases and comparisons then made against all databases using SQL. 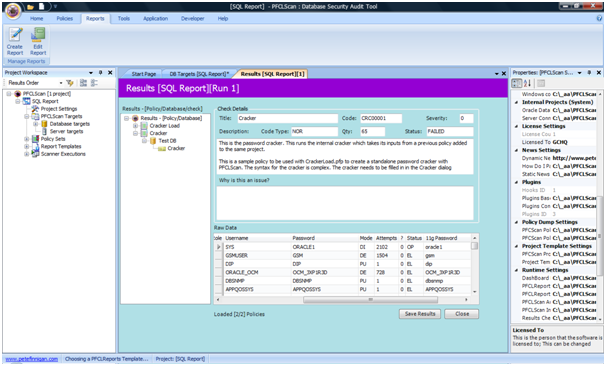 The simple SQL above looks for the worst case scenario, a password set to the username (in UPPER) and account status is open. Of course using an Oracle database to summarise scan data is fine and we have customers who want to do this (actually with a mysql database) as they already correlate their scanning with other tools into a database. 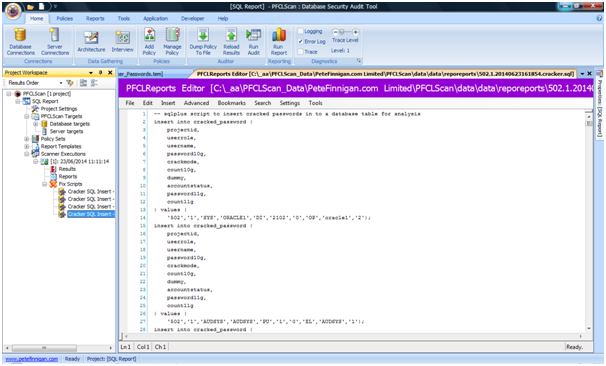 PFCLScan is well equipped to integrate with existing systems as you can see it can easily generate SQL. This SQL could also be fix scripts or audit settings. What would be nice is to avoid all the manual steps of running the scan, running the report to generate the SQL file and then running that file against the database to insert the data. 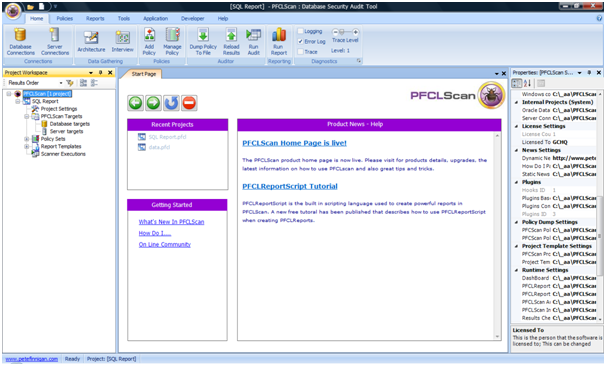 PFCLScan can be easily configured to automate processes such as this. 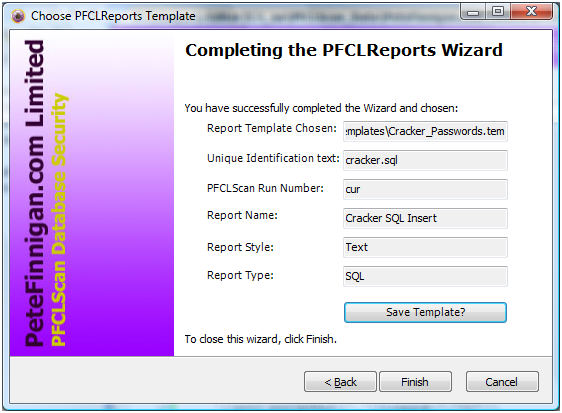 We can specify multiple tasks such as running a scan, running a report and executing SQL all as one step; this is the automation feature of PFCLScan. 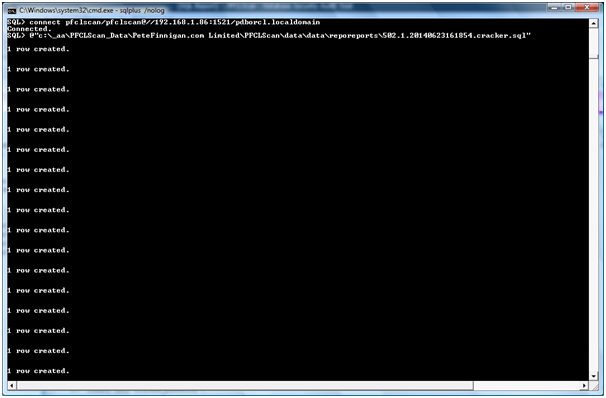 We can also run projects from the command line so that PFCLScan can easily be integrated with other tools. You may have noticed that the SQL table is "awkward" as we specified all fields as VARCHAR2 where some are clearly numbers. 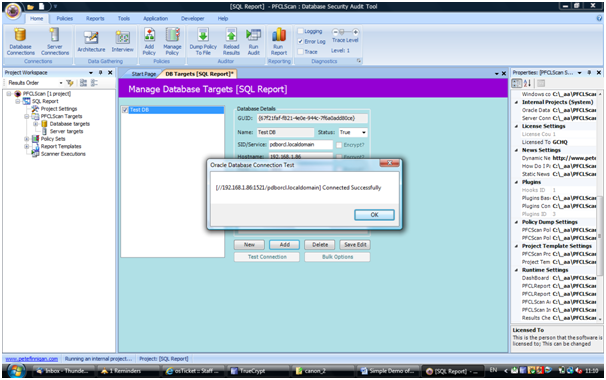 This is because we took the simplest approach in this example to generate the SQL Insert in one line in the report template. We also have another fine grained approach where we can specify each column of results where the SQL must be specified in the policy. Watch out for an example of this in an upcoming blog post. 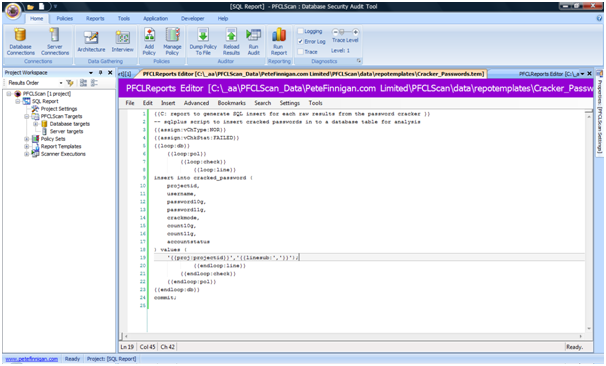 In the next blog post we will show you how to automate the scan, generation of SQL and execution of that SQL for this same example and discuss how automation can be taken much further in PFCLScan to allow PFCLScan to be more powerful for you and also to allow easy integration with other tools.